The self-described “front page of the Internet” may have a smaller user base than Facebook and Twitter, but for most Reddit users, the site’s curated message boards are a go-to source for news, according to a new study released Thursday. While only 7 percent of U.S. adults told pollsters they used the site, 78 percent of Reddit users surveyed said they relied on the site’s discussion threads for news. More so, 45 percent of Reddit users also received the latest information about this year’s presidential election from the site. Reddit’s high consumption of election news matches Facebook’s (52 percent) and Twitter (43 percent), according to a study by the Pew Research Center. Pew’s study also found that Reddit’s user base was more likely to skew young (between ages 18 and 29), male and liberal compared to the overall public. 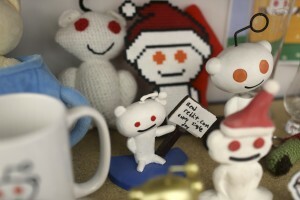 Holcomb said the study stopped short of answering whether Reddit’s make-up created an echo chamber. But, he said, the findings do suggest that although a small share of the public goes to Reddit, it’s a population with a deep interest in news and public affairs. Pew’s conclusions were drawn from a three-month analysis of Reddit comments around the 2016 presidential election last year, specifically during May, June and September. Researchers said more than 350,000 comments on Reddit mentioned a presidential candidate in that time frame, which is actually less than one percent of the total 165 million comments left on discussion threads in those three months. The study said this sliver of political conversation is to be expected for a platform where millions of threads vie for the top 25 spots on Reddit’s “front page,” adding that the finding was also on par with major news outlets, where election news failed to dominate 2011 coverage. 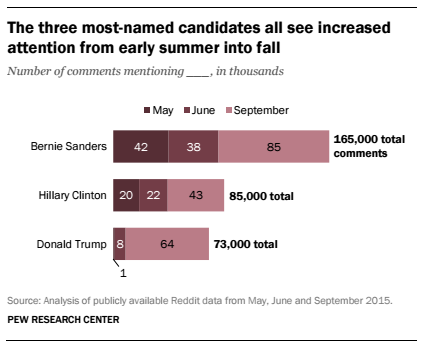 But which candidate was mentioned the most, months ahead of the primary season? Bernie Sanders. In all, 165,000 comments mentioned the Vermont senator in three months, more than the combined total comments of Hillary Clinton (85,000) and Donald Trump (73,000). Sanders also benefitted from a dedicated subreddit “SandersForPresident” where the campaign set up grassroots efforts to connect with voters. Most comments that mentioned the 21 presidential candidates then were found in political subreddits, although not all facets of the election conversation occurred in political forums. Forty percent of those comments also appeared in non-political subreddits, including ones dedicated to atheism, CBS “The Late Show” or forwarded messages from grandma. Breaking down the political conversation on Reddit further, Holcomb said the conversation about the presidential candidates is not driven equally by all users. Pew’s study found that 60 percent of users who name-dropped a candidate did so in a single comment. However, those who posted two comments amounted to 15 percent, while a quarter of the engagement left three or more comments, meaning a minority of users was responsible for the vibrant conversation around the election. “Reddit’s not necessarily the kind of mass market, mass medium that we might have experienced say in the golden age of television network news,” Holcomb said. “We certainly live in a much more fragmented media environment today,” he said, adding that the discussion around politics or political candidates is much more participatory today and happening in more disparate settings than it was years ago. Holcomb said public officials and newsmakers are adapting to this fragmented media environment. President Barack Obama alone has recently written for SCOTUSblog, done interviews with YouTube stars and online outlets like Buzzfeed and Vice, and participated in a highly publicized Reddit AMA, or Q&A, in 2012. Pew’s Reddit study is part of a series that closely looks at the news discussion and consumption taking place on social media websites.